ATLANTA (AP) — Jorge Alfaro’s first multihomer game gave the Miami Marlins just the lift they needed to snap a four-game losing streak. 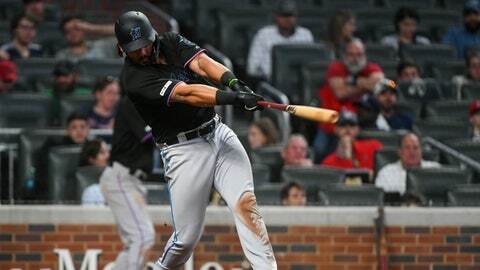 Alfaro homered twice, including a tiebreaking, two-run shot in the ninth inning, and the Marlins stopped the Atlanta Braves‘ four-game winning streak with a 4-2 victory Saturday night. Adam Conley got two outs to earn his first save. He gave up a single to Freddie Freeman before striking out Ronald Acuna Jr. and working out of a bases-loaded jam on pinch-hitter Charlie Culberson’s popup. The Braves, who went 1 for 13 with runners in scoring position, led 1-0 in the first after Freeman’s RBI double. Atlanta went up 2-0 in the fourth on Dansby Swanson’s RBI single. Miami tied it in the fifth on homers by Alfaro and Peter O’Brien. Wright gave up five hits, two runs and one walk in six innings. He struck out four. Marlins starter Sandy Alcantara allowed four hits and two runs in four innings. After walking none in a win against Colorado, the young right-hander issued five free passes in 93 pitches. He had no strikeouts after whiffing six in his season debut. The Marlins had dropped nine straight at SunTrust Park. They improved to 5-16 at the Braves’ third-year home. Marlins: Mattingly said OF Garrett Cooper likely won’t be ready to begin baseball activities until next weekend. Cooper is on the injured list with a left calf strain. Braves: Manager Brian Snitker gave Donaldson a scheduled day off at third base. Injuries limited Donaldson, the 2015 AL MVP, to 113 games in 2017 and 52 last season. “We’re going to give him a break here and there,” Snitker said. “With this long stretch, I’m going to give a few guys a day off next week, but it was just more of today or tomorrow. He can get a left-handed matchup tomorrow.” … Acuna and Nick Markakis left six runners on. Albies left five. Atlanta C Brian McCann will go on the injured list after straining his right hamstring in the fourth. He left the game and was replaced by Tyler Flowers, who was hit by a pitch on the outside of his right hand in the fifth. X-rays came back negative on Flowers, but it’s likely he won’t play for a couple of days. The Braves plan to call up C Alex Jackson from Triple-A Gwinnett. Swanson made two impressive plays at shortstop. He caught a liner and threw out Alfaro, who was leading too far off first, to end the second. Swanson ended the third by catching a ball on a short hop that glanced off Wright and throwing out Curtis Granderson. Snitker said Johan Camargo, in the lineup for Donaldson, will start again Sunday. Camargo, who went 0 for 3 with two walks, was the everyday third baseman last year and hit. .272 with 19 homers and 76 RBIs in 134 games, but was moved to a jack-of-all-trades role after Donaldson signed a one-year deal. Camargo, a switch-hitter, started in left field Wednesday against the Chicago Cubs. Marlins: LHP Caleb Smith, seeking his first win of the season, is 1-0 with a 2.16 ERA in two career starts against Atlanta. Braves: LHP Sean Newcomb will make his seventh career start against Miami. He is 4-1 with a 2.06 ERA vs. the Marlins. Newcomb did not get a decision in his first start this season, allowing six hits, four walks and striking out three in four innings of an 8-0 win over the Cubs.